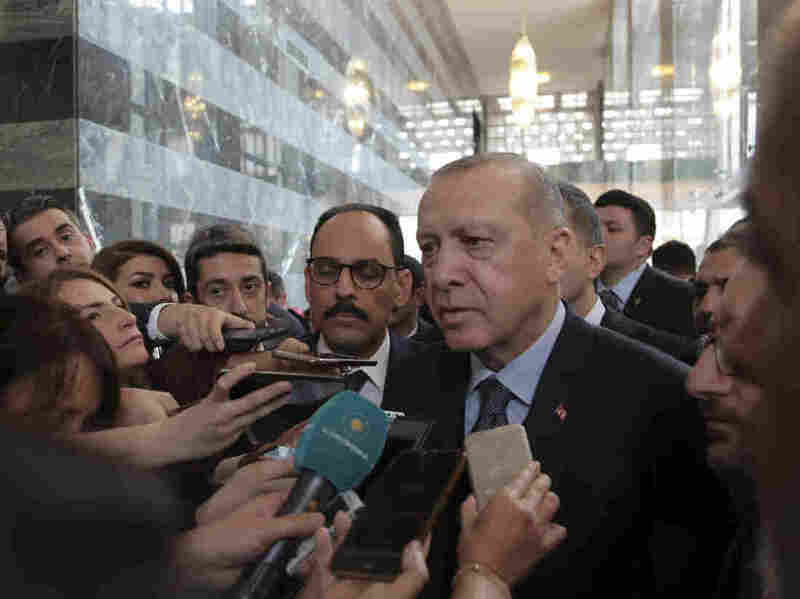 Erdogan Cancels Meeting With Bolton, As U.S. Seeks To Reassure Allies On Syria The meeting was canceled moments before it was to begin, reflecting Turkish anger over U.S. insistence that a Kurdish militia fighting in Syria be protected after American troops withdraw. Turkey's President Recep Tayyip Erdogan canceled a meeting with U.S. national security adviser John Bolton on Tuesday, in an apparent snub. Erdogan disagrees with U.S. calls to protect Kurdish militants in Syria who have helped in the fight against ISIS. Turkey's President Recep Tayyip Erdogan has apparently snubbed U.S. national security adviser John Bolton, canceling a planned meeting to discuss the withdrawal of U.S. troops from Syria as well as the fate of a U.S.-allied Kurdish militia fighting ISIS in Syria. Bolton's meeting with Erdogan was canceled moments before it was to begin, reflecting Turkish anger at Bolton's insistence that those Kurdish forces be protected after more than 2,000 American troops exit northeastern Syria. Erdogan cited the "local election season and a speech to parliament for not meeting with Bolton," The Associated Press reports. But the Turkish leader also used his speech to rail against protection for the YPG, which he considers a terrorist organization allied with separatist Kurdish groups operating within Turkey. Bolton's trip to Turkey comes as he and U.S. Secretary of State Mike Pompeo are visiting American allies in the region, seeking to quiet concerns and ease confusion about U.S. policies following President Trump's surprise announcement last month that all U.S. troops will be leaving Syria. Trump's withdrawal order sparked questions and pushback — including the resignation of Defense Secretary Jim Mattis. And key questions remain about ISIS, the fate of Kurdish fighters and control over the land they've seized in Syria's long-running civil war. Unlike the U.S., Turkey "sees these Kurdish authorities as being aligned with militants it considers terrorists, and has threatened to attack the parts of Syria they control," NPR's Ruth Sherlock reports. The distrust runs both ways. In Syria, Kurdish leaders aren't happy at the possibility their territory might fall into Turkey's grasp — leading them to hold previously unthinkable negotiations with Syrian President Bashar Assad's government. "Kurdish militias here have sacrificed hundreds of lives in fighting ISIS and taking control of this territory," Sherlock reports, "and they see Turkey as a bigger threat than ISIS to their survival." Bolton did meet with Turkish presidential adviser Ibrahim Kalin on Tuesday, but that session didn't seem to produce any breakthroughs. Afterward, Kalin said that while Turkey is willing to coordinate some activities, its military doesn't need to ask anyone's permission to conduct operations over the Syrian border. Around the time of the Bolton-Kalin meeting, Erdogan was speaking to Parliament and renewing his public stance against the YPG. "Erdogan said preparations for a military operation in northern Syria are 'complete,' " NPR's Peter Kenyon reports from Istanbul. "He added there would be 'no concessions' in Turkey's fight against terror groups, and rejected Bolton's comment that Syrian Kurdish fighters would not be harmed." By emphasizing the differences between his views and Bolton's, Erdogan echoed his New York Times op-ed piece from Monday, in which he said that with the U.S. leaving, it's time for Turkey's military to take control. But that same day, Pompeo said the Turkish leader had previously offered reassurances that Turkey would protect U.S. allies — referring to the Kurds. Pompeo said Erdogan made the commitment during a phone call with Trump just before the U.S. president announced the troop withdrawal. On Dec. 19, when Trump ordered the Pentagon to pull U.S. troops out of Syria, he said he was doing so because their mission was over. "Our boys, our young women, our men, they're all coming back, and they're coming back now," Trump said, as he declared victory over ISIS. But Trump has recently acknowledged that ISIS has not been eradicated entirely, and his mentions of the timing for withdrawal have become much less concrete. "We won't be finally pulled out until ISIS is gone," Trump said Sunday. Over the weekend, Bolton said the drawdown is subject to conditions and that there is no set deadline. "There are objectives that we want to accomplish that condition the withdrawal," Bolton told reporters in Jerusalem. "The timetable flows from the policy decisions that we need to implement," he said, seemingly in reference to the fight against ISIS and the future of the Kurdish militia. The mixed messages have created confusion over exactly what the U.S. policy is in Syria and the broader region — and that perception has persisted, despite State Department officials' insistence last week that "the United States is not leaving the Middle East." Hoping to clarify American policy for some of its most vital allies, Pompeo has begun a weeklong trip through the region. He started it off in Amman, Jordan, where he said Tuesday that the Syrian pullout doesn't mean the U.S. is abandoning the international fight against ISIS. "That battle continues," Pompeo said. "The president's decision to withdraw our folks from Syria in no way impacts our capacity to deliver on that." There is also some fence-mending to do. Bolton's visit to Ankara comes one week after Pompeo angered the Turkish government by saying the U.S. wants to be sure "the Turks don't slaughter the Kurds." Pompeo doesn't plan to visit Turkey on his current trip. After Amman, Pompeo is slated to visit at least eight Middle East capitals, from Cairo to Riyadh and Kuwait City. In the background of the talk about ISIS and Kurdish fighters, another spat is bubbling between the U.S. and Turkey, centering on the NATO ally's recent arms deal with Russia. As NPR's Kenyon reports, "Washington is displeased with Ankara's move to buy Russian S-400 missiles, and has recently offered to sell them Patriot missiles instead." NPR Diplomatic Correspondent Michele Kelemen contributed to this story.